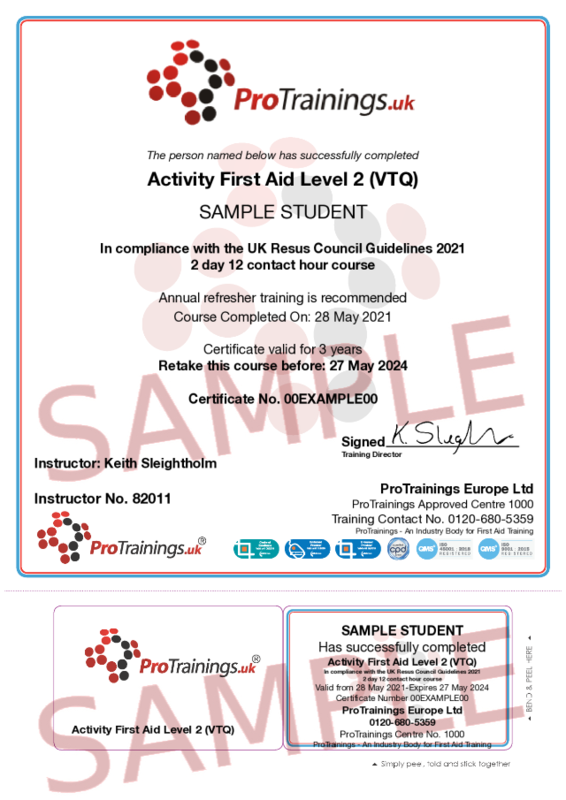 The purpose of the Activity First Aid Level 2 qualification, is to provide the learner with the skills, knowledge and understanding of first aid to provide appropriate care and manage life threatening conditions, illness and injuries sustained in an activity environment. This is achieved through the understanding of the general duties, responsibilities and treatment principles of first aid. This course is taught over two days with a minimum contact time of 12 hours as a class course or blended. Administer first aid to a casualty with injuries to bones, muscles and joints. Administer First Aid to a casualty with suspected head, neck and back injuries. Demonstrate how to manage a suspected spinal injury. Administer First Aid to a casualty with suspected chest and abdominal injuries. Describe how to recognise and manage a chest injury. Describe how to manage a burn and scold injury. Describe how to manage an incident involving electricity. Administer First Aid to a casualty with eye injuries. Describe how to recognise and manage eye injuries. Describe how poisons enter the body. Describe how to recognise and treat a casualty affected by common poisonous substances, including plants. Administer First Aid to a casualty with anaphylactic shock. Describe how to recognise and treat the effects of extreme cold occurring by participating in activities. Describe how to recognise and treat the effects of extreme heat occurring by participating in activities. 2 Administer first aid to a casualty with injuries to bones, muscles and joints. 3 Administer First Aid to a casualty with suspected head, neck and back injuries. 3.2 Demonstrate how to manage a suspected spinal injury. 4 Administer First Aid to a casualty with suspected chest and abdominal injuries. 4.1 Describe how to recognise and manage a chest injury. 4.2 Describe how to recognise and manage an abdominal injury. 5.1 Describe how to manage a burn and scold injury. 5.2 Describe how to manage an incident involving electricity. 6 Administer First Aid to a casualty with eye injuries. 7.1 Describe how poisons enter the body. 7.2 Describe how to recognise and treat a casualty affected by common poisonous substances, including plants. 8 Administer First Aid to a casualty with anaphylactic shock. 8.2 Recognise and manage a casualty suffering from anaphylactic shock. 9 Know how to provide First Aid to a casualty with suspected major illness. 10.1 Describe how to recognise and treat the effects of extreme cold occurring by participating in activities. 10.2 Describe how to recognise and treat the effects of extreme heat occurring by participating in activities.